arguing that co2 driven warming reduces crop yields is absurd. not only do loner growing seasons yield better, but CO2 is plant food for chissakes. commercial greenhouses augment CO2 to 700-900 ppm to get, wait for it, BETTER YIELDS and faster growth. Bourbon for cars is the politically incorrect term. 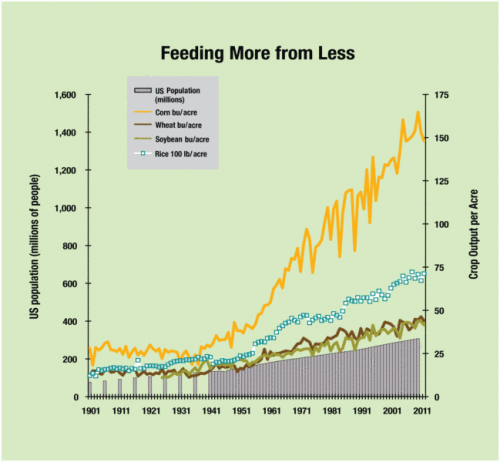 Seriously, though, how much of that increase is wholly dependent on cheap oil/fertilizers? Oh, and I don't disagree on the Corn/Ethanol problem. I rather violently agree (ie I have a brick to match the face of the next person trying to explain why that stupidity is good for the economy/the environment/their political lobbying tribe). What I disagree with is the statement that that's the systemic problem we're facing. The systemic problem is higher risk of mass starvation due to local events. Food prices might not be as complex as the atmosphere, but you can't just point to per-acre yields and blame biodiesel. Have you written this up in another post? I'm curious as to the food price changes myself. Cheers, bc. @me - That's what worldwide and diverse markets are all about. if it's possible to move food cheaply and freely, a local disaster does not need to cause starvation. A flood in Burma does not affect what and corn in Kansas. Famine-related starvation events happen not when there is an overall shortage of food, but when forces such as a lack of transportation infrastructure or corrupt, kleptocratic, or inept governements allign to prevent food from reaching people who need it. As to corn ethanol, modern agriculture is the process of turning fuel into food. Ethanol production reverses this, and inefficiently at that. The VAST majority of that increase - best guess, at least 85% of it - isn't due to "cheap oil/fertilizers." It's doe to the efforts of (maybe) the greatest man who ever lived, surpassing even George Washington: Norman Borlaug. For every life that the noisy, self-serving 'community organizers' and 'human rights activists' have saved or made better, Borlaug saved/improved...what...5,000,000? 10 mil? 20 mil? So naturally, the schools teach & preach of the saintliness of the organizers & activists & revolutionaries. Gandhi, whose admiration of Hitler is deleted and whose 'peaceful, nonviolent revolution' against the English imperialists resulted in war that killed a million people plus or minus, and made 10 million homeless, is lionized. Mao, who was quite possibly insane, was the direct cause of the deaths of 60-70 million or so of his own people. (China is oddly reluctant to publish official figures, for some unknown reason.) But you'll only read that in the most obscure & arcane textbooks. The inconveniently caucasian Borluag and his magnificent fellow scientists and geneticists are ignored entirely. I wonder why that might be. Unlike federal agencies, especially the Pentagon, the private sector always does more for less. Every year. It's vice-versa in government. Its tiring to hear how ethanol is converting our food to fuel. Have any of you ever actually studied the issue? 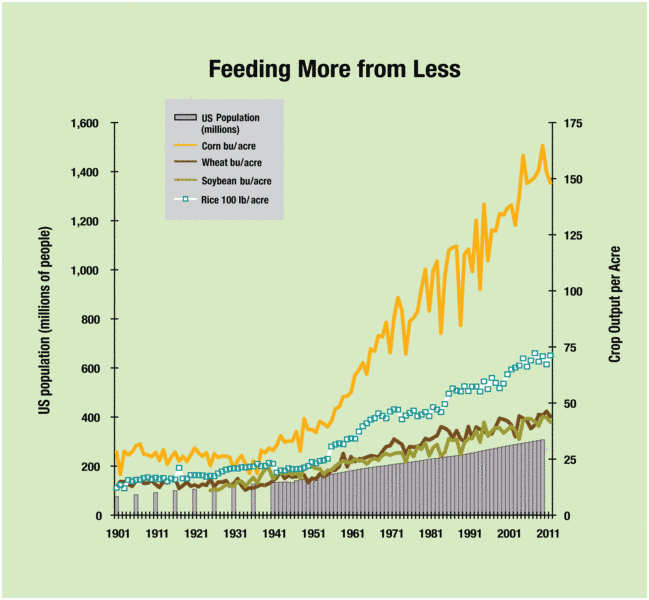 The primary use of field corn has always been livestock feed. (Not your cornflakes). The left over corn after the alchohol is extracted is distillers grain. Distillers grain is in many ways a higher quality animal feed than corn. The lastest advancement is to extract corn oil from the distillers grain (Used for bio-deisel), leaving yet higher feed value distillers grain. In fact many feedlots opt for distillers grain over corn in rations. IS ethanol to answer all. No. But its much better than the rumor mill would have you beleive. The biggest cause of starvation is corrupt govt if you want to point fingers. @El Coronado. There is some research that suggests about 30% of that increase is due to the increased amount of CO2 in the Air since WWII. In a geological context, the plants are actually starved for CO2 at the moment and would prefer a level much higher. But yes the CO2 gains are also from fossil fuels. It is the price of oil that is raising the cost of food. The problem with food prices is not grain prices, its the fact that fuel prices are so high. As someone who grew up on a Kansas wheat farm I am so tired of people thinking that the price of grain is the main reason food prices are so high. If you google “The Food Price Conundrum Can be Found in a Loaf of Bread” you will find a blog post that makes my point better than I can but I will try to explain it anyway. Keep this in mind: "The cost of energy is reflected more in the price of bread than the cost of the wheat". The price of wheat is currently $6.15 per bushel at the Kansas City Board of Trade. One bushel of wheat weighs approximately 60 pounds. That bushel of wheat can be made into 42 commercial loaves of white bread (1.5 lb loaves), or 90 one pound loaves of whole wheat bread. That is about $0.15 worth of wheat in a 1.5 lb loaf of white bread, and about $0.07 worth of wheat in a one pound loaf of whole wheat bread. After the grain is sold in the market what do food processors do with it? They have to transport it with diesel, process it in plants run on electricity, bake it with natural gas, then package it in plastic, and then ship it to the store with diesel. Many people say that the price of grain is too high, twice what it would be without ethanol. Ok, say we go back to the prices of ten years ago before the big ethanol boom, $3.00/bushel (more or less). How much is this going to lower the price of bread? Does anyone really think it would matter? The cost of a loaf of bread is not going to go down significantly. Now cut the price of fuel in half, now that could change food prices. And yes el coronado, Dr. Norman Borlaug is a Saint. A couple of points re your comments. There is no way you can take 40% of the corn grown out of the food market and put it in the fuel system without raising the price of corn. Otherwise, we can all throw away our economics books which say that as demand goes up relative to supply, price goes up. Re your comments that the original price of a commodity at its source is a small fraction of its price at the consumer level. I have been interested in this subject for decades. The cost of the chemicals in household products (Chlorox, antifreeze, salt, etc.) is only a few cents. Packaging, distribution, and retailing costs eat up the rest. As an engineer, this is frustrating. We work to reduce the cost of manufacture by a small amount, while distribution and retailing is done much as in ancient times. Yes, we haul it to market in motorized vehicles rather than oxcarts, and have super markets rather than small shops, but the overall scheme is the same. I believe this distribution system is ripe for clever improvement. Using internet ordering, groceries could be boxed up at a central warehouse and delivered to the home. No individual physical shopping at all. No crowds at the store. No exchange of money. No automobile expense. A huge saving in manhours nationally. This is already being done on a relatively small scale. Why not greatly expand it? As the streets get more crowded and gas prices climb, this sort of thing will become more attractive. It seems to me that paper studies by transportation experts could find many alternatives to our current (ancient) farm/factory to market system. An interesting subject worthy of lots of thought. >>> Not only does this mean that we have have billions of people on Earth and not starve, but it also has freed up labor for more productive and value-enhancing activities. What? OH, NO, what will the poor downtrodden jobless Ag worker DOOOOOOOOOO? Clearly, we need to STOP this immediately, implement STRICT local food-growing standards and do EVERYTHING POSSIBLE to increase the number of people working in Agriculture!! Hey, think of the poor children of these unemployed Ag workers, dammit!! Are You Totally Heartless?!?!? "And yes el coronado, Dr. Norman Borlaug is a Saint." Within another hundred to two hundred years the number of people killed by Borlaug's work will greatly exceed the number saved by it. Destroying the soil for short term gains is long term insanity and famine.